Back in December, I mentioned that a very expensive new road in Derbyshire, England, was going to be named by vote of the people, and that one of the candidates was Lara Croft. The idea of driving on the vast expanse of Lara Croft Way proved too good to resist, and as such, the vote is overwhelmingly in favor of honoring Derby’s own Core Design with Lara Croft Way. She got over 89 percent of the online vote! Said Counselor Lucy Care, “The vote really captured the imagination of people from across the world. Despite my lack of gaming knowledge, I accept that a majority of 89% for Lara Croft is too overwhelming to ignore!” That’s Lara in a nutshell; you can’t ignore her, because everything about her is just overwhelming. It’s nice to see that A) the Internet vote actually mattered to the people making this decision and B) Connecting Derby took the results seriously. 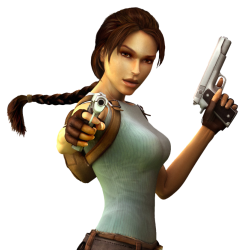 Even if the landslide win was the result of a joke, the fact is Lara Croft was born in Derby, and Core Software should be honored for their incredibly popular video game franchise and its starring character.